TDN‘s Sue Finley is one of those who knows there aren’t many places better than Deauville to attend a horse sale, so she’s excited that Arqana is getting ready for four days of selling August yearlings, beginning with two select evening sessions, after racing, on Saturday and Sunday, followed by an Open session on Monday, and their V.2 sale, which is in a separate catalogue, on Tuesday. There is a small 5% drop in the number catalogued over the four days, from 503 last year to 479 this year, though there is an 8% drop, 15 yearlings, from 189 to 174, for the two select evenings. Like most sales last year, Arqana’s 2016 August sales declined from 2015: the ‘select’ gross dropped 5%, from €31.4 million to €29.8 million, though the average dropped further, almost 15%, from €247,299 to €213,293, as the number sold surged 10% from 127 to 140, and the clearance rate from the catalogue improved from 67.5% to 74.1%. For the four-day total, there were 349 sold in 2016, exactly the same as in 2015, and both gross and average declined by 4.5% from 2015 to 2016. That’s why we’ve said all along this year that comparisons to 2015 are probably more meaningful than to 2016 at this year’s sales. The select sale has grossed between €29m-€31.4m the last three years, while the four-day gross has ranged between €42.5m-€45.2m, so the two figures to look out for are a €30-million gross after the first two nights and a €45-million gross at close of business next Tuesday. There are 11 stallions with seven or more yearlings catalogued for Saturday and Sunday evenings; among them they account for nearly 60% (102 of 174) of the select yearlings catalogued. 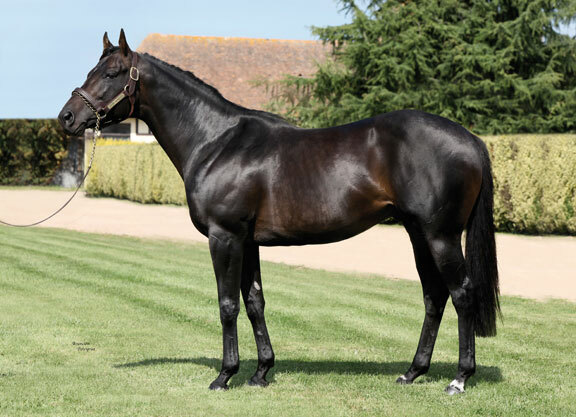 Two relatively younger proven sires whose first foals arrived in 2012 and are now represented by their fifth crops of yearlings, Ireland’s Ballylinch Stud’s Lope De Vega and France’s Haras De Bonneval’s home-grown Siyouni, top the list of Select sires by number catalogued, with 14 and 13, respectively. With another 10 catalogued for Monday and six more in Tuesday’s V.2 sale, Siyouni has the highest representation of any sire over the four days, with 29 yearlings catalogued. Probably not coincidentally, Lope De Vega and Siyouni rank one-two on the TDN European fourth-crop cumulative sire list; Lope De Vega leads the group in all black-type categories, as well as money earned, with 22 Black-Type Winners (BTW), 42 Black-Type Horses (BTH), 12 Group Winners (GSW), 23 Group Horses (GSH), three Group 1 winners, eight Group 1 horses, and the earners of more than $10.6 million (click here). Siyouni is second with the earners of over $9.4 million, including 14 BTW, nine of them group winners. Only two ‘older proven’ sires (11th or higher crop of yearlings) are among the 11 with seven or more catalogued for Sat-Sun: The Irish National Stud’s Invincible Spirit, who has 10 in over the weekend; and Coolmore’s incomparable Galileo, with nine. Also with nine are Juddmonte’s Frankel, from his third crop of yearlings, and Coolmore’s Camelot, from his second. Coolmore and Juddmonte also stand the two top first-crop European sires, Australia and Kingman, with nine and eight catalogued, respectively. With seven each are France’s Haras de Montfort & Preaux’s (formerly La Cauviniere) Le Havre, Ireland’s Gilltown Stud’s Sea The Stars, and England’s Dalham Hall’s Iffraaj. Le Havre also has 17 catalogued on Monday and two on Tuesday, so his total of 26 catalogued over the four days is second only to Siyouni’s 29. French first-crop sires Olympic Glory (Haras de Bouquetot) and Anodin (Haras Du Quesnay) have totals of 20 and 14, respectively, over the four days. Contact Bill Oppenheim at [email protected] (cc [email protected]).